Wish You All A very Very Merry Christmas !!!!!!!!!!!!!!!!!!!!! Christmas, the last celebration of the year surely brings joy and merriment in our lives and we all eagerly wait for the new year. Almost whole December month, I become a baking God and try to bake as many new things I can for my family and friends. I don't know why but this happens every year with me. I think this is the charm Christmas brings. 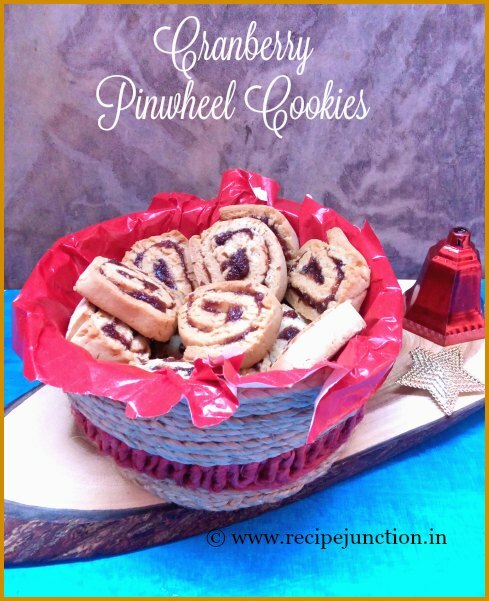 This year too I made Dundee Cake for the first time, baked some Shortbread cookies and this Pinwheel cookies which was in my to-try list for so long now. Finally I attempted on last weekend. 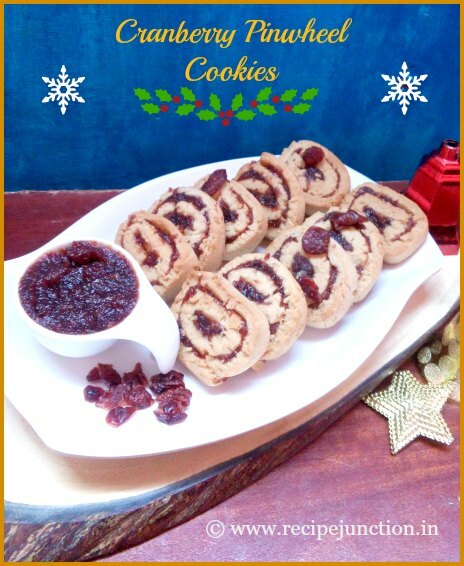 In these cookies, first cranberries are cooked and made into a jam like consistency, then it was filled inside cookie dough, rolled and cut into round cookies. Though the step looks little tricky, but it's absolutely very easy-to-make. Orange zest/essence : 1 tsp. Make the dough first. In a bowl, add flour, baking powder and baking soda. Mix well. In another bowl, beat butter and sugar. Add oil, milk and orange zest or essence. Beat for 2-3 minutes and mix well everything. now add the flour mixture little by little in the butter-sugar mixture. Add half of the dry ingredients and beat on low speed until just incorporated. Mix rest of the dry ingredients with a wooden spoon until evenly incorporated. If the dough is too dry to hold together, stir in up to 1 tablespoon more milk. Divide the dough in two portions, wrap in cling film and refrigerate both the dough for 30 to 45 minutes. 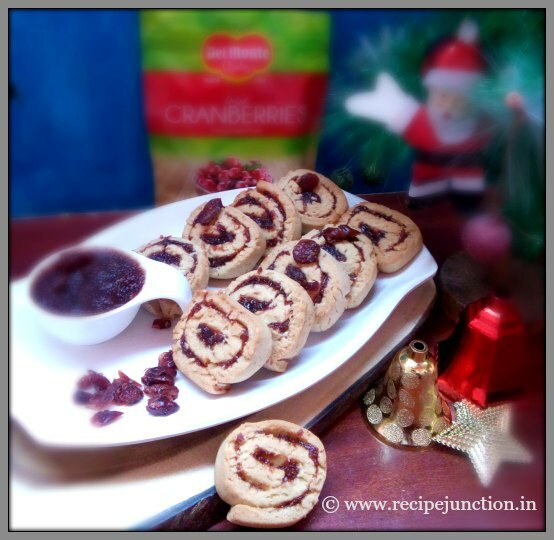 Making cranberry filling : Combine cranberries, honey, orange essence and 2-3 tblsp. water in a medium saucepan and bring the mixture to a gentle boil and cook, stirring, until the cranberries soften, 4 to 5 minutes. Let cool slightly. Transfer to a food processor and puree. If the mixture seems dry, stir in up to 2 teaspoons water. Transfer the mixture in a container. Take out the dough, divide into into 2 portions. Spread some butter paper on a plain surface. Sprinkle some flour on the butter paper and roll out the dough up to 1/4 inch thickness. 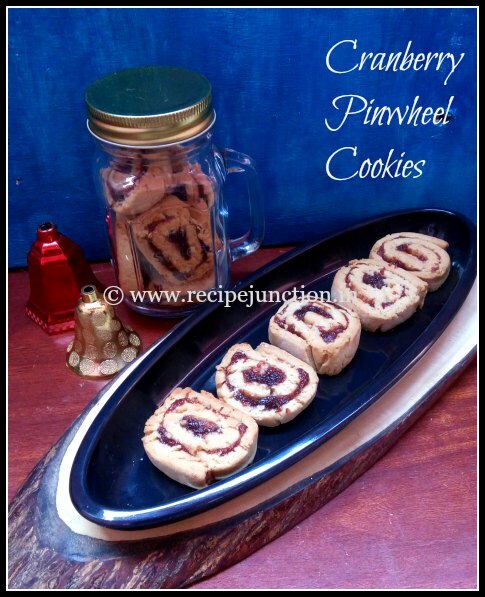 Now, spread some cranberry filling evenly on the rolled out dough in a thin layer. Now roll the dough tightly inwards till the end in a log shape. At this time, you can refrigerate the cookie logs for 10-15 minutes. Similarly, prepare the other dough. Line a baking tray with parchment paper. Now cut the cookie logs with a serrated knife into 1/4 inch thick slices and place them on baking tray, keeping 1/2 inch space in between each cookie. Bake in 180 degree Celsius, for 15-18 minutes. Remove when done and cool completely. 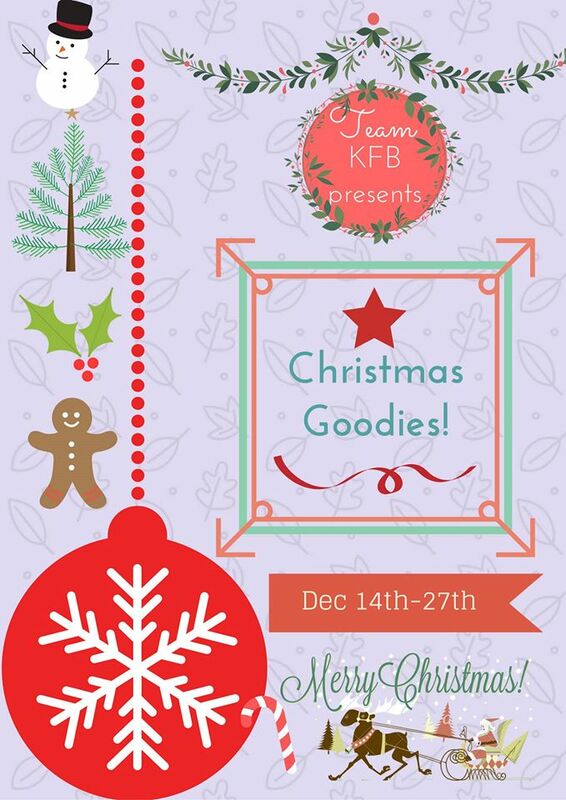 After baking, cookies will feel soft but after it cools down, it gets hard and crispy.